"With folks filling state parks, campgrounds and backyards to celebrate the Fourth of July, it’s vital that precautions are taken prior to lighting campfires and setting off fireworks," said Dan Laux, DNR fire prevention specialist. "You can have fun while celebrating with friends and family, even if you’re being safe and making sure your property and our natural resources are protected. The best way to avoid the risk of starting a wildfire this holiday weekend is to attend public fireworks displays and leave the lighting to the professionals." 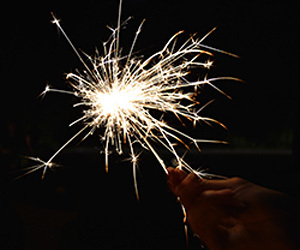 Sparklers can reach 1,800 degrees Fahrenheit — hot enough to melt gold. Always place sparklers in a bucket of water when they have gone out; when thrown on the ground, they can cause grass fires. "Fireworks and campfires are a great way to celebrate the Fourth of July, but you'll enjoy the holidays much more knowing that your family and your property are safe," Laux said. "Fire prevention is everyone’s responsibility."